It has been a hectic few weeks around here. School has taken a front seat for both Nate and I, and we've been working hard getting ready for finals which are about a week and a half away. It has been busy, but not overwhelmingly so (knock on wood!). In the meantime I've let my blogging go to the wayside, so I'm going to try to play catchup here. We had a great Easter feast at Gramma B's and then sat for a few hours watching various babies of Nate's cousins do various adorable things. The day before Easter Nate and I went in to Spring Green for lunch and some shopping with his parents. We ate at the General Store Cafe which is on my top 10 list of favorite restaurants. They have a rotating menu, so there is always something new. They also make a ton of vegetarian and vegan food, which is always amazing. Nate went for the spicy chicken sandwich. It was awesome. 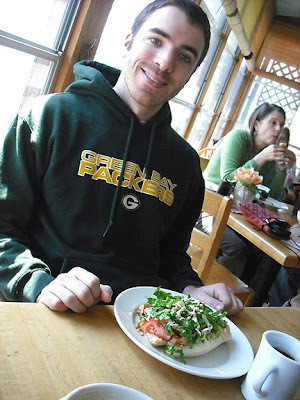 He also felt glad to be back in WI where he can wear his Packers sweatshirt without fear of being harassed. 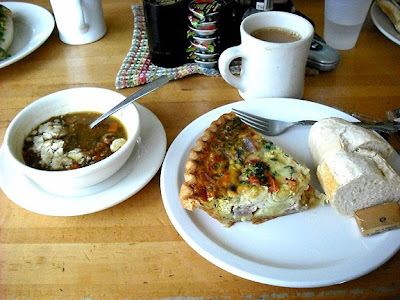 I went for the artichoke heart quiche and the garden veggie and lentil soup. Yum! Our trip home was a nice little escape from school and work. Both of us are REALLY looking forward to summer. 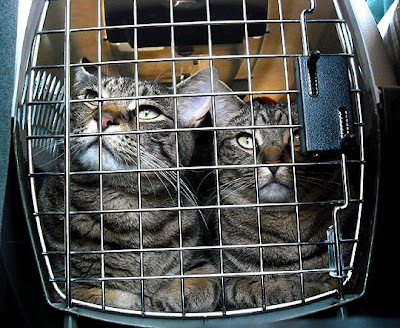 I totally agree with you,t hat photos of your two cats in the carrier is so cute and funny! Aww. That quiche looked awesome, by the way! Your cats look so content! Usually cats are crazy when they're in a carrier. You always take such good couple shots when you're eating out. I hope all is going well! 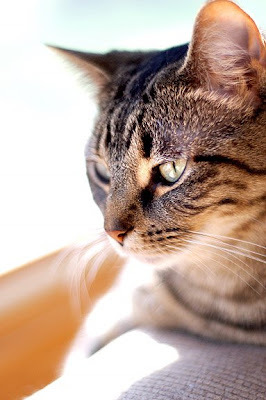 Your cats are beautiful. I had an old best friend that had a cat that looked just like them, and his name was Mercedes. I soooo want cat(s), but I also want a dog. Joe only wants a dog. lol. Maybe one day I'll find both that mesh well together.